Cawsome Creation is the Brand Name for any productions I have worked on, since taking the career changing step of enrolling on a Film MA/MSc with Raindance & Staffordshire University in November 2014. Some of the work was shot prior to this, but only edited after. ​If you see the name 'Mass Distortion Productions' in the credits; you'll know these are early works from when a few friends decided to have a go at amateur film-making. As far back as I can recall, I was always fascinated by the movies & dreamed of getting involved one day. I remember writing a play whilst at Junior School about Roman Gladiators -which I think would have heavily plagiarised such classics as Quo Vadis (1951), The Robe (1953) & Demetrius & the Gladiators (1954) - & then when in Senior School I wrote a sequel to Evil Dead II (1987) for an English exam, which wasn't too dissimilar to Army of Darkness (1992); although in this case, I'm pretty certain neither I nor Sam Raimi copied off each other! By adolescence, there were no Drama related subjects taught at my school & I had only one ambition; to follow in my Granddad's footsteps by joining the Royal Navy. 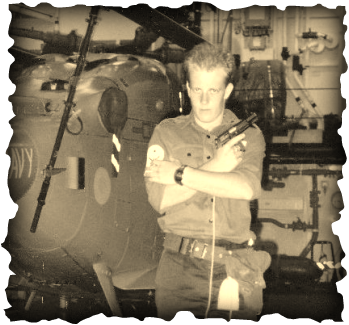 I joined the RN in March 1989, served aboard HMS Sheffield during the 1991 Gulf War & was medically discharged in November 1996. For my resettlement, I qualified in Hypnotherapy & Psychotherapy, but it must be pointed out, I had originally planned to learn Hypnosis for stage entertainment, but found psychoanalysis so fascinating that, I worked part-time in this field for 13 years. When Derren Brown first appeared on our screens, entertaining us with 'Mind Control' stunts, some of which were supposed to be be under the guise of N.L.P., I was somewhat confused. I thought to myself, " I know N.L.P., why can't I do that?" 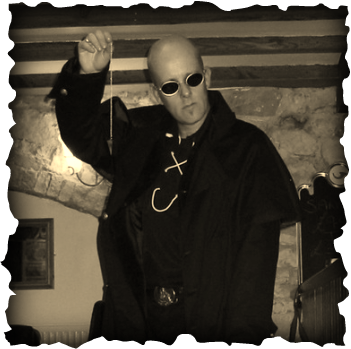 ​This began a journey into studying Magic & Mentalism for a few years. I performed under the name 'Nick Knight', mostly for free to gain experience, but just after getting a couple of paid gigs, I folded myself in half on a bouncy castle - pissed up - which popped 2 ribs off my sternum & cause soft tissue damage to my lower back. This happened at an adult's birthday party & most guests were from the comedy improv group, MissImp which I belonged to at the time. I took a couple of years away from entertainment to focus on a business venture to help Military Veterans to go self-employed, which ironically was an expensive disaster! My interest in filming was rekindled by my cousin (22 years my junior) when he asked me to act in a few of his amateur productions. In 2013 when he was first a Film BA student, he asked me to help him to monetise his productions, because I had been studying marketing for a few years. He had an original web-series in production entitled 'Waterside' & I pointed out it would have been better to have done another Fan Production first to start building an audience before attempting an original piece. However, it was too late in the day & so it was planned to do Hitman: Vengeance as the next project. This was the birth of Mass Distortion Productions & the plan was to do the Hitman project, but also some short films exploring different genres to see what our audience preferred. After this, we would look to fund a full length feature. By the time 'Waterside' was completed, my cousin buckled under the pressure & no longer wanted to continue. I had written the first draft of Hitman: Vengeance by this point & so the 3 remaining team members had a meeting & decided to carry on. The Pilot Episode to Hitman: Vengeance went live on 1st July 2014 & it was hoped to release another episode every 3 to 4 months. If you're involved in filming in any shape or form; you'll know how awkward it can be to organise a shoot with zero budget. All the usual problems began to surface; people pulling out last minute, trying to get 6-8 people to agree on a suitable date for filming, etc. Despite this, we shot some other shorts & one of these was so well performed by the actors, that we decided to shoot 2 more days & turn it into a full length feature, entitled 'Remain Humane' which is currently in post-production. You may have gathered by now that I'm something of a work & studyaholic! As I was playing the lead in the Hitman project too, under a stage-name, it dawned on me during the filming of the Pilot Episode, that whilst it's easy to look mean & menacing on screen; I had given Agent 47 lines of dialogue too. So, I enrolled with Derby Academy of Acting so as to give a better performance to this iconic character. There may be a couple of scenes in the first 2 episode where you'll see this, but are unlikely to get the full benefit of this training until Episode 3; if we get to shoot it. By the end of summer 2014, we had a new team member, a sound recordist & editor, & the future was looking good. I received an email from Raindance advertising their MA/MSc course & so looked into whether I could get financing, initially I did have it, & this seemed like the perfect opportunity to start turning productions from amateur to pro. I wasn't expecting the number of setbacks which appeared in the next few months after enrolling on the course & I shall not bore you with them either. But following a meeting in the December, it became obvious that I was the only dedicated team member. Mass Distortion Productions as a potential business venture has ended, but still has a few amateur works to release & if any of the team members assist on Hitman: Vengeance's final episodes; these will be released as a joint production. Finding myself in an almost Robert Rodriguez situation - Rebel Without a Crew - & a Masters Degree to contend with meant that apart from a couple of sick days; I didn't actually take a day off from film related activities for over 2 years. Although unlikely, rather than facing litigation from former colleagues years down the road, I needed a new name for my own productions & as I live with a rescued crow, the name Cawsome Creations seemed good enough. I like to consider myself a Writer/Director who can also act to a reasonable level, but as on most projects I have found myself having to adopt many responsibilities which I'm not as interested in; I guess for now I'm Prodiwreditographor!! All this said, I'm not bitching, because I truly believe I have returned to a vocation which I was destined to explore. If I'm working on a filming project, then life is good: if I have food in my belly, somewhere to crash out with a couple of beers, & my bills are paid; then what more is needed? 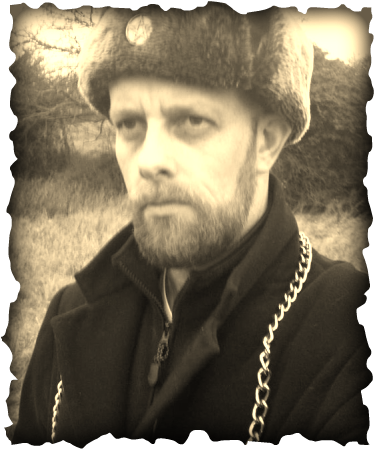 No that's not Rasputin; it's me from a couple of years ago! At the moment, I'm also Producer & anything else which might need doing in an emergency! Taken in Hong Kong in 1991 when I had hair. I think this picture was taken on the night I first met my future wife, although I wasn't aware until 5 years later. A further 5 years & she was my ex-wife. There I am with a loaded pistol; think of all the pain I could have saved us both! I did find it annoying that most Mentalists also wear black, because I wore it out of choice, not as a costume.